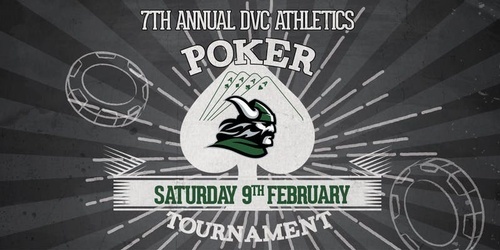 A fundraiser to benefit DVC Athletics that will provide support to DVC student-athletes. $75 Buy-In gets you $2,000 in chips, 2 drink tickets, & buffet food throughout the night. Limited seats available. Online ticket sales ends February 9, 2019. Will accept on-site registrants if there are extra slots available. All skill levels welcome. Registration and check-in starts at 6PM. Tournament starts promptly at 6:30PM. You will have options to advertise your business and reach more than 300 players and volunteers while having an evening of appetizers, beer and wine and player prizes.